Learn how to make appetizers for New Years Eve. It is a great way to spread a buffet table for this special occasion. I say this because by this time of the year I am so wiped out from all the cooking. The week before Thanksgiving every year begins the planning and cooking for these major and such special holidays of the year. I always look so forward to these with great expectations of making new and more exciting recipes each year. By the time Christmas dinner is ending I am exhausted as I am sure most of you are. Learning how to make finger foods or appetizers for New Years Eve is the best way to go in my opinion. After a season of feasting, a table of finger foods is a relaxing way to ring in the New Year. Many can be made ahead and stored in the refrigerator or can be frozen. There are many that are easy to assemble or even down right simple to make; especially those made with prepackaged foods. At this point the easier the better as long as they taste good and must make a presentation for a special occasion. While I am cooking my Christmas dinner, I am also thinking about how to make appetizers for New Years Eve with my leftovers. There are always so many leftovers and most can be applied to the buffet table. No one will know they are leftovers if done correctly. For instance, almost any meat which is on your Christmas menu will make great spreads for party sandwiches for the most elegant occasions. Here are a few ideas in making sandwiches to serve as appetizers for New Years Eve. Your local bakery can assist you to getting the right kind of bread and also in cutting it the way you need it to be. It is much more uniform than you cutting it unless you have the equipment. Make a CORNUCOPIA by first removing the crust from all sides of close textured loaf of bread. Slice the bread very thin and spread each piece with a soft filling. Roll two opposite corners to the center to form cornucopia; overlap and spread corner with soft butter to hold. Fasten with toothpick until butter hardens to hold. These can be placed in a shallow pan, covered with damp cloth and refrigerated until serving. FANCY SHAPED PARTY SANDWICHES make pretty appetizers for New Years Eve by cutting off the crust on a solid loaf of sandwich bread. Slice the loaf (or have baker) of bread lengthwise in thin slices. Cut designs out with 2 inch cookie cutters for the occasion. Spread filling on one and top with another. NOTE: Some people spread the entire long slice of bread and top with another and then cut. This is easier but has more waste. If it doesn’t have the filling on it, I save the trimmings for bread pudding, stuffing or bread crumbs. To make PINWHEEL SANDWICHES for appetizers for New Years Eve you will want the solid loaf of bread. Cut the crusts off except for the bottom; gives firmness while cutting. Slice in long slices about 1/8 inch thick using a sawing motion. Spread with smooth soft sandwich filling. At one end lay a small thin pickle or a few stuffed olives. Beginning at this end roll up in jelly roll style. Spread with a little butter on the last lap of bread to make it stick; it will stick when chilled. Wrap each roll in wax paper and place in refrigerator. To serve slice4 about ¼ inch thick. ROLLED SANDWICHES can be made to serve as appetizers for New Years Eve by spreading very fresh slices of bread with soft cheese filling (Try adding thin strips of hot peppers). I use leftover cheese balls from Christmas and add a little milk and mayonnaise to make it softer. Roll up and fasten with toothpicks and chill. These can be brushed with melted butter and toasted in the oven for hot appetizers. Whatever sandwiches you select, make them even more special by decorating the tray for the special occasion. Arrange a centerpiece in the middle of the tray and arrange the sandwiches around it. Most people I know either serve ham or turkey (or both) for Christmas dinner and always have leftovers. Amazing recipes can be made from these leftovers; so amazing and delicious no one will know. 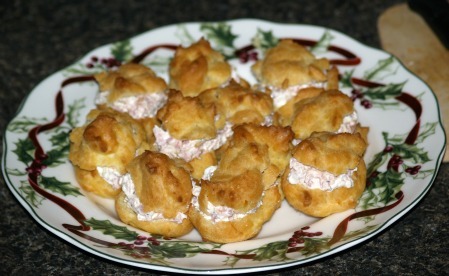 The following are some of my favorite appetizers for New Years Eve to make with these leftovers. Mix horseradish and pepper into softened cream cheese. Spread about 2 tablespoons of mixture on a slice of ham; roll up jelly roll style. Spread second slice of ham with mixture and roll around the first roll. Continue making all rolls using 2 slices of ham for each roll; cover and refrigerate until ready to use. To serve slice ham rolls about ¼ inch thick and serve on small crackers. The savory spices of India make this a flavorful appetizer for New Years Eve. Sprinkle gelatin over ½ cup of the chicken broth; let stand about 2 minutes until softened. Mix remaining ½ cup chicken broth and the milk in saucepan; heat over medium high heat just until hot. Reduce heat to medium low and stir in the gelatin mixture; cook stirring constantly until gelatin is dissolved. Whisk ½ cup of the hot gelatin mixture gradually into egg yolks. Whisk egg yolk mixture back into the gelatin mixture. Whisk in curry, turmeric and red pepper. Cook over low heat until thickened 5 to 7 minutes while stirring; DO NOT ALLOW TO BOIL. Transfer to medium bowl and stir in lemon juice, butter, salt and black pepper. Refrigerate checking and stirring consistency frequently for about an hour. NOTE: Should be like unbeaten egg whites. Stir in chutney, turkey, pecans and minced coriander. Beat cream until stiff peaks form; stir ¼ cream into custard mixture to lighten. Stir in remaining whipped cream; spoon mixture into oiled mold. Smooth top and cover with plastic wrap; refrigerate overnight. To serve loosen mousse from mold by dipping briefly bottom into hot water. Shake gently to loosen and turn out onto platter; serve with bread. 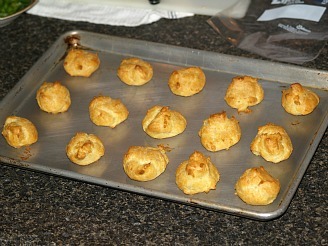 These miniature puffs can be made ahead and placed in air tight plastic freezer bags to freeze. To serve as appetizers for New Years Eve have filling ready and fill before serving. Heat water and butter to rolling boil in saucepan; stir in flour. Stir vigorously over low heat until mixture forms a ball about 1 minute; remove from heat. Beat in eggs all at once and beat until smooth and glossy. Drop dough by slightly rounded teaspoonfuls onto ungreased cookie sheet. Bake until puffed and golden brown and dry about 25 minutes; cool on wire rack. Filling: Combine and blend ham and remaining ingredients. Just before serving cut off tops of puffs with sharp knife; remove any filaments of soft dough. Fill each puff with rounded teaspoonful of ham mixture. NOTE: I arrange the little tops which are cut off back on top sticking slightly out of ham filling. This may not be among your collection of leftovers but it certainly is made easy to prepare with packaged products. Combine bread crumbs, cheese, flour, basil and garlic powder in shallow bowl. Dip cooked ravioli in eggs; dip in bread crumb mixture to coat and set on baking sheets. Heat 1 tablespoon butter and 1 tablespoon oil in medium skillet over high heat. Add ravioli and cook on both sides until golden brown. Serve with sauce and garnish with red pepper stars and oregano sprigs.